The 2019 Super Bowl brought another moment of advertising galore from beverage endorsements to an unlikely documentary courtesy of Burger King. 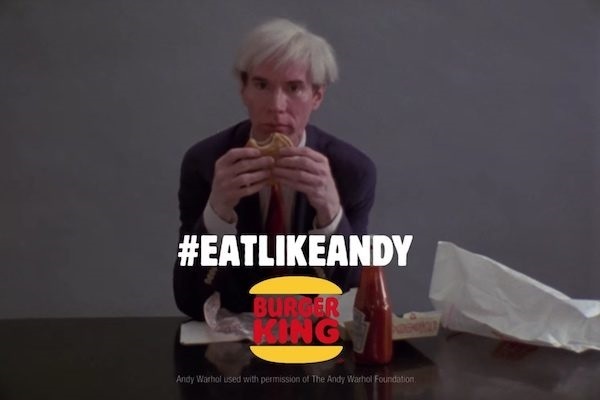 The fast food giant launched its ‘#EatLikeAndy’ campaign accompanied with a footage of the eponymous 1980s artistic icon Andy Warhol eating a ‘Whopper’. The video represents an endorsement for Burger King by the icon, however, upon closer investigation by advertising publication Ad Age, there is more than meets the eye. Ad Age reported that the 1982 video was originally produced as part of the film 66 Scenes From America by Danish documentarian Jørgen Leth. Leth wanted to get for him right away but Warhol rather not waste time and settled on the Burger King option instead. Burger King has shared the entire clip of Warhol eating the ‘Whopper’ online and it appears to be a great yet uncomfortable piece of performance art.